It is currently fashionable for cattle in this country to be either dehorned or for the polled variant to be bred for. This shows what a plastic age we now live in. Back in the days before plastics, horn was an immensely useful and valuable commodity. On the live animal, one form of head yoke for the working oxen was directly attached to the horns. In more recent times, horns were useful on animals chained in the byre as they could not slip the chain over their heads. 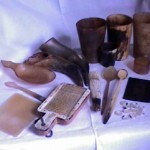 The trade in cattle horn as a raw material for craft work is evidenced in archaeological deposits by large quantities of the bony cores from within the keratinous horn sheaths. The horn sheath is not easily detached from the bone core until the connective tissues have decayed. This was usually done by soaking the entire horns in water filled pits. Much ingenuity could be used in the disposal of waste horn cores, with instances of the soaking pits and drains being lined with the cores. On many archaeological sites, these bone cores are the only surviving evidence for the use of horn, as horn itself rapidly decays when buried. Extant finds from more recent periods do indicate what a wealth of uses horn can be put to. Pre-eminently horn has been used as a container for drinking out of. As historical re-enactors soon discover, a large drinking horn has the drawback that it cannot be put down without spilling the contents. On the other hand if it is emptied it needs refillingâ€¦.. The subsequent refinement was the horn beaker with a flat disc of horn forming the base. Such horn beakers were ideal for use by children as, like plastic, they do not break if inadvertently dropped on the floor. The basic horn was retained for drenching livestock with. Other uses of the basic horn with only minor modifications were as a blast horn, as in “Little boy blue come blow up your horn”, as a flask to contain, for example, gunpowder or sand for sharpening blades, or as an ink well. Cross section slices of horn could make such things as napkin rings, bangles, funnels for filling sausage skins and other items whose function is now forgotten. Longitudinal slices of horn could produce scoops and shoe horns. More modification was needed to make panes for windows or lanterns (NB lantern is a corruption of lamp-horn), horn books, combs, hair pins, tooth picks, buttons and spoons. The Scots used to advocate eating porridge with a horn spoon, as horn does not absorb the heat from each mouthful like a metal spoon. 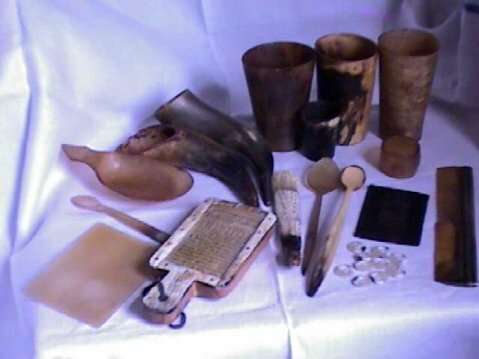 There is still a small commercial firm in the Lake District making a range of objects from horn, though all the cattle horn used there nowadays is imported from Africa.